Caregivers suffer depression at three times the rate of other people. And if you do not think that this affects workplace productivity, you're missing the mark on this problem. When employees leave work at the end of the day, their "second" job begins, and like everyone else, the stress and strain of work, care-giving, and home life begin to form a box from which one feels that their is little escape. Some employees may take it a day at a time. And although few will admit it, some may secretly wish--and feel guilty for it--the natural death of their loved one. Combine this with any substance abuse issues, depression, financial problems, or the IRS bill that wasn't paid last year from a squeezed in part time job, and you risk for a seriously troubled employee. 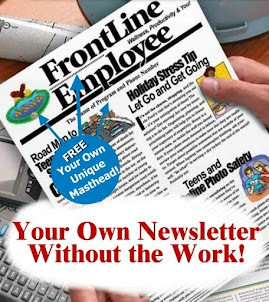 You can only reach these employees with what is an EAP newsletter for employees. I hope you have one, and I hope it is monthly. Because if it is not, you're putting on a nice show, but you're not penetrating what is known as "top of mind awareness." You've seen the stats on how many times we are bombarded by commercials and promotions on a daily basis. As I type this blog note, and glance to the right and left of me, I have count 31 such messages. I mean, it is insane! Your EAP is fighting this clutter, but you still have to figure out how to be not a pest, but a welcomed guest. The strategy is knowing the issues in the workforce, issues SHORT, INTENSE, NO FLUFF SOLUTION-ORIENTED CONTENT employees look forward to getting, and frankly, the rest is waiting for the phone to ring. I would like to add one more key. 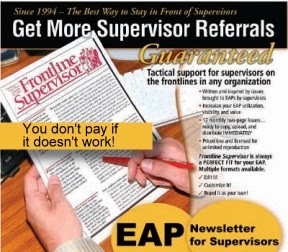 Add in writing, to the bottom of any newsletter, that the EAP is confidential. You are fighting perceptual erosion of confidentiality on a continual basis because fear of whether a program is confidential is a real energy force that is relentless. You can't fight this with a quarterly newsletter sheepishly and apologetically slipped into an employee's inbox once per month. Use this content in your next newsletter that I wrote - you may do so without attribution. The following is copyrighted content that may be used by you the reader of this blog post. No attribution required, but you could put a copyright and link to http://workexcel.com, we would appreciate this very much because it allows us to improve rankings on search engines (and it harder now that ever!) So, you may also edit this article and add your professional expertise to it. 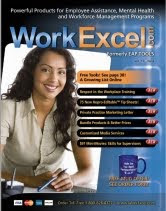 However, for an editable, reproducible, web usable, and brand-able EAP Newsletter and articles of this type for your company, EAP, or wellness program, go here. Since depression is a disease and not a moral or character failing, you must be on-guard for its signs and symptoms exactly like you would for the flu during the wintry months. In your case as a caregiver, this may be periods of time when you are under inordinate stress from sort of responsibility. There are many symptoms of depression, and the EAP is at your disposal for a full assessment, but here are five important rules regarding depression and personal awareness especially for caregivers: 1) Don’t dismiss stress you are experiencing and the symptoms you suspect may be depression by using positive "self-talks” and internal lectures to yourself about “handling it better” or “brushing it off.” Instead, get a quick and easy assessment at the EAP. 2) Understand the difference between “caring” and “doing.” This means being open to help from other people who love and care about you, and from services that can ease your burden or encourage independence by your loved one when appropriate. "Meals Without Wheels" may not be as wonderful as your home cooking, but it can help take the edge off of a bad day for a stressed caregiver. 3) Don’t wait to feel strained before asking for help. Learn to see the strain around the corner. If a tough assignment at work is coming soon and you anticipate conflict and added stress in care-giving, consider your options. The EAP can also help you trouble-shoot solutions. 4) Know what activities rejuvenate you and your spirit, so when you get respite care, (any extended break) you know what to choose that will best retool and re-energize your ability to carry forth. 5) Find another caregiver and develop a friend or buddy in that person, someone you can bond with socially, exercise with, or mutually find shared support.